Pigment wise, these palettes are nicely pigmented, showing up well with about two swipes, and I reckon they have the same formulation as the eyeshadow duos. The texture feels hard but if you swipe about twice you get a pretty decent pigment. Not exactly buttery but nothing that needs too much scrubbing for the colour to show up. I use my fingers but a sponge tip applicator is included. I think these shadows work best either with fingers or with sponge tip applicators. Brushes may cause it to look too sheer unless you have very dense brushes. You can see from the swatches that the shimmer in the mid-green and the bronze shade are strong, and the khaki and dark green make good contour colours. I was dithering between getting Forest Green or Smokey Charm but after I’d swatched them both, I knew it was going to be Forest Green by a mile! Here’s my inexpert look I did using Forest Green. You can see the colour sheers out a little on the eyes. The color does fade towards the end of the day, but I wasn’t expecting all that much for the price. If you use it over an eye base, you can expect it to last longer. The colours also tend to be a little flat. You pretty much get a solid block of colour without any variance or uniqueness – again I did not expect it for the price. 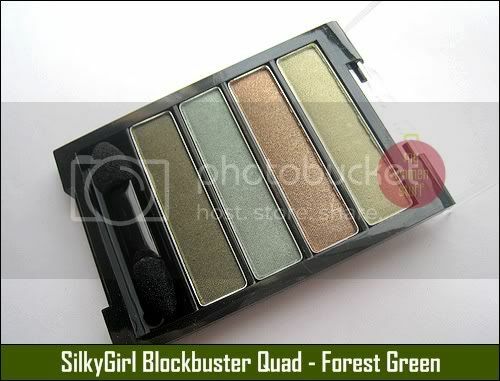 If you’ve been curious to see how you look with green eyeshadow (and most brown-eyed girls look stunning in green – it brings out our brown eyes 😉 ) pick up the Forest Green Blockbuster quad from Silkygirl Cosmetics. At RM18.80 (or RM22.90 usual price) you won’t break the bank and you’ll still look good 🙂 You can see the swatches of the other palettes by PrettyBeautiful and Lipglosseater who both did great jobs of it. Did you try any of the Silkygirl Blockbuster quads? How do you feel about green eyeshadow? I just bought this palette as well!!!! I like Silky Girl’s eyeshadows (affordable!!) but like you mentioned the colours fade at the end of the day. heeeheee, i know what you mean, i broke many of my eyeshadows from travelling. I like how easy it is to use my fingers and just apply, other like Rimmel’s (within the afforable range), I have to swatch a few times to get the colours right. Just wish they have more colour choices. Augh now I want it again! I don’t NEED it… but I waaaaan iiiitttt! Wouldn’t that make it more suitable for night?? Nowadays I only do neutral looks for office. lol. I got the same palette as you!~ When I was the palettes , it was the green palette that spoke to me. XP. Contemplating to go back to get other palettes. I have too much shimmery eyeshadow, so this is good for a more toned down, daytime colour. the green looks gorgeous! it looks expensive. I think i can survive with rm20 less in my bank right….lol. I love the green and the bronze! This palette looks so pretty! I love the look you did with it, it’s beautiful!